Fairlands Valley Spartans finished two complete and counting teams at the Hertfordshire Cross Country Championships. A great achievement in such a competitive event. HAZEL SMITH was first finisher at 50th with 40 minutes 35 seconds for the women’s race over 8 kilometres in Cassiobury Park, Watford. She was supported by CLAIRE EMMERSON, 54th in 41:01; JENNY GARRETT, 64th in 2:32; ERICA GRAYSON, 76th in 45:55; PENNY SCHENKEL, 79th in 46:15; CALANTHA CHAPMAN, 85th in 49:16 and SHARON CROWLEY, 89th in 52:52. Starting at 1.15p.m. the men got an extra loop in the woods making their race up to 12 kilometres. DAVID RIDDELL got under 50 minutes for the undulating course. He was 71st in 49 minutes 11 seconds. TIM SABAN was 97th with 52:36; TOM SAUKA 100th in 53:35; STUART ARCHER 101st in 53:38; NICHOLAS CROWLEY 117th in 58:40; JIM BROWN 127th in 1:03:45 and TIM ROBINSON 130th in 1:05:40. These were the senior (i.e. aged 20 and above) championships. The veteran championships are on Sunday 25th March. 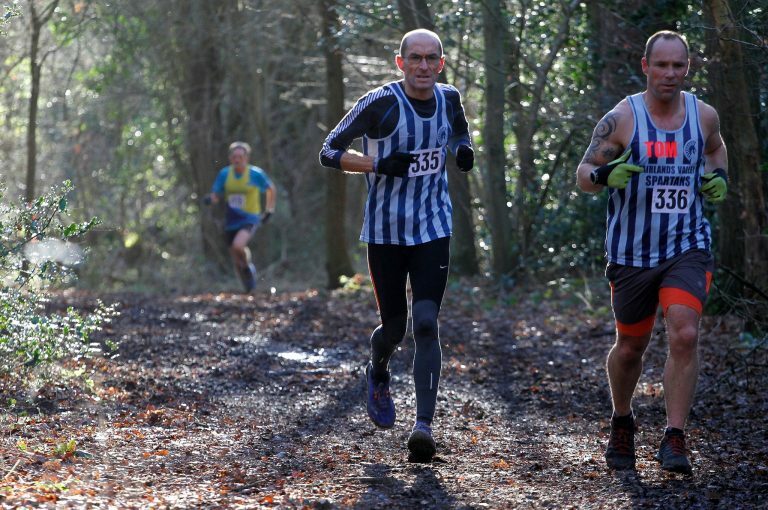 The Spartans will return to Watford for a cross country league race this Sunday 14th January. Got a place in the London Marathon? You can train with Fairlands Valley Spartans and then you can coach to the big event as the club have booked a bus. Cost £10. Bookings to Roger Biggs by emailing roger@thebiggs.net. Nineteen Spartans lined up at Stevenage parkrun, and recent joiner DANNY SCANLON finished 5th and was first Spartan home in 20 mins 29 secs. BARRY OSBORNE (22:52), MARTIN DUDLEY (23:30), MARK BEASLEY (23:35) and CRAIG BACON (23:45) all finished in the top 50. It was also good to see JAMES SOUTH running close to 26 minutes following his long rehab from a broken leg. VERITY FISHER was the first Spartan woman to finish, 12th in 27:41, with CLAIRE EMMERSON right behind in 27:43. KAREN PALMER (28:30) and TRACY PEZ (29:01) also top 50. MICHELLE MARCHANT was the notable performer elsewhere, returning to Bedford, the scene of her first parkrun, and notching a new course PB of 32:03. ANDY JAY went to Westmill and finished 22nd in a time of 41:49.